There are a number of strange uses people put to bridges (other than crossing over a river). 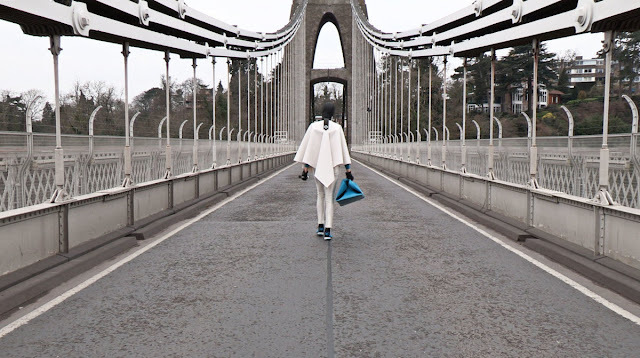 In the photo above Di Mainstone, a British artist, films Georgina Hampton Wale carrying a 'digibow' and electronic equipment to coax music out of the stays and suspension links of the Clifton Suspension Bridge in Bristol England. Mainstone has continued her experiments on the Bob Kerry Pedestrian Bridge in Omaha, Nebraska and on the Tower Bridge in London. I was going to provide a recording of her 'bridge' music but I couldn't figure out how to attach an audio file to my webpage. However, you can press on the link above to find her recording of the Brooklyn Bridge. The Guardian had an article today about people hanging from the St John's Bridge over the Columbia River in Portland, Oregon to stop an ice cutter and other ships owned by Shell Oil from passing under the bridge on their way north to explore for oil in the Arctic. 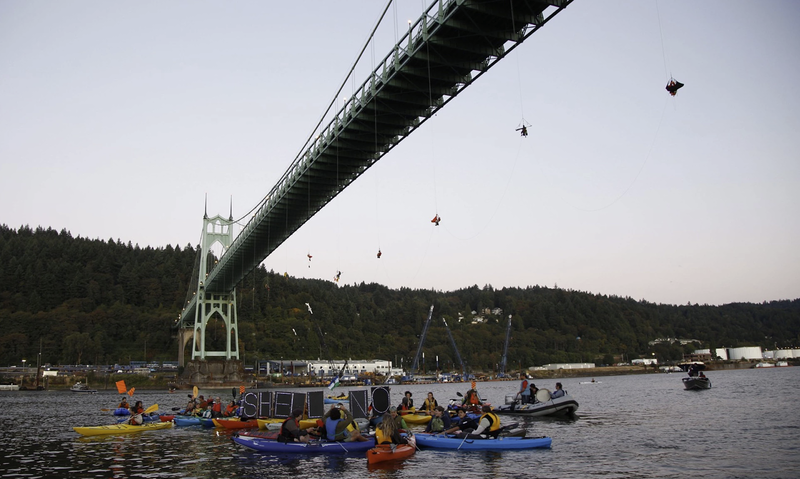 They are using the bridge to (hopefully) prevent global warming and environmental degradation of the Arctic. 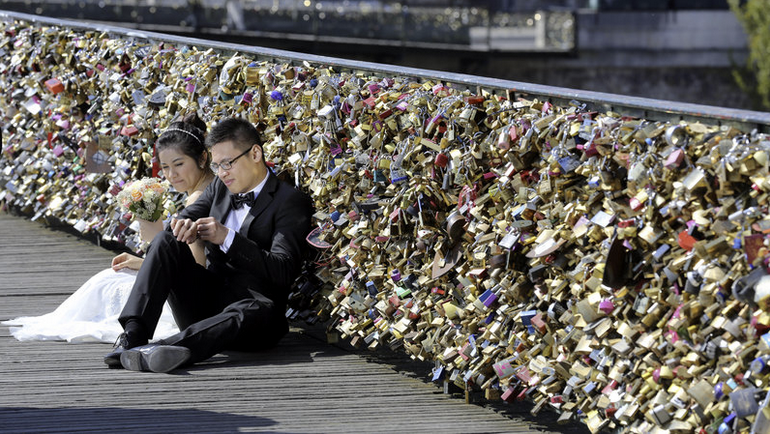 Putting locks on bridge rails has become a popular way for couples to declare their eternal love for each other. However, bridge owners have become concerned about the additional dead load on their bridges. The locks were particularly thick on the Pont de Arts in Paris and so the city eventually removed them. Even more dramatic is the desire to end one's life by jumping off a bridge. I guess for some people, living becomes so intolerable that the thought of hurling themselves off a bridge deck (instead of making them terrified) makes them happy! 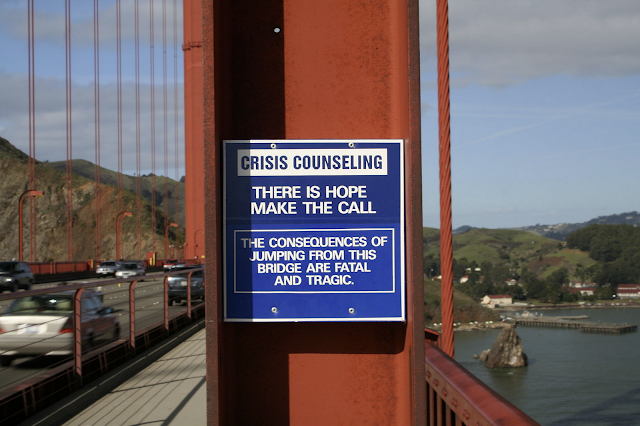 In the photo of the Golden Gate Bridge above signs, counselors, and netting are all provided at considerable expense to try to prevent suicides. I previously wrote about a friend who worked the late night shift re-decking this bridge. He said about once a week, someone would slam on their brakes and throw themselves over the railing before anyone could stop them.